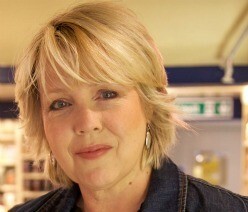 Forgive me, there is VERY little chocolate in today’s post, all but none. I want to write about a meal, a culinary masterpiece, and hope that you will all give me license to go off piste from time to time. I am assuming that my readers, like me, will be excited and interested in food other than chocolate, at least occasionally. 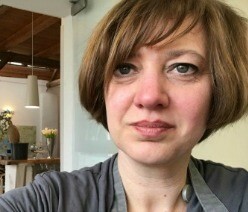 And I am very privileged, as a food writer, to be meeting and working with chefs and patissiers of such brilliance, that it would be a crime not to write about them and their work. Friday lunch saw me motoring, wind in my hair on a perfect English summer day, to Seasalter in Whitstable for lunch at the Michelin starred The Sportsman. 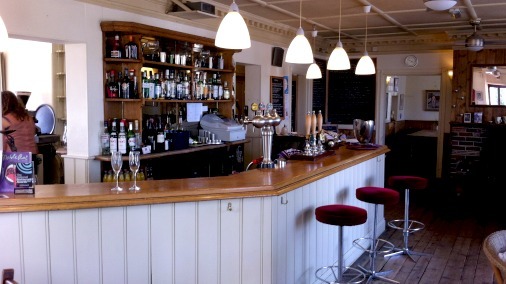 It was a special occasion, the reputation of this pub by the sea is well known, so I was in high spririts. I was not disappointed! 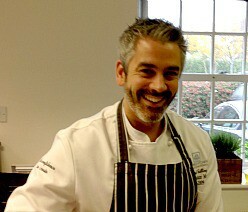 I have met Stephen Harris before, in the kitchens of Chapter One, Andy McLeish’s Michelin starred restaurant in Locksbottom, where all five of Kent’s Michelin starred chefs were together for one memorable night to cook a feast. I was perched on a sink, Stephen was shucking oysters, and we talked chocolate mostly, and T Rex. I am a fan, but had yet to discover my namesake song ‘Cat Black’. Thank you for that Stephen. I was struck by his open curiosity, his interest in, and attention to, detail, and the sheer brilliance of the dish he put up that night, a single oyster, lightly poached and dressed only with a drop of cream, a small spoon of rhubarb granita and a sprinkling of toasted seaweed (more of which later). 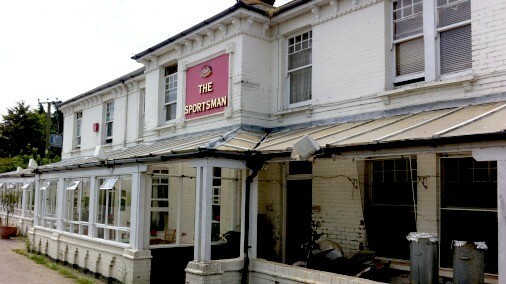 So on to the food, as that is the whole point at The Sportsman, and it will take some time. We took four hours in all as we went for the tasting menu, but admittedly we were up for the hedonistic maximum and revelled in each moment for as long as possible. Plus Stephen popped in a few extras for me for the pleasure of it. 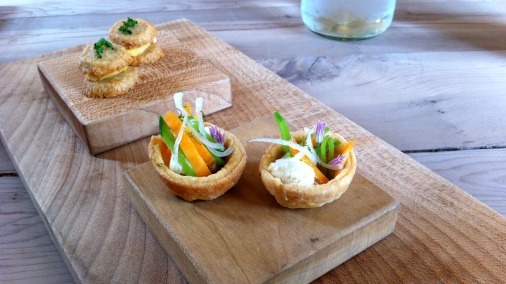 Parmesan and Ashmore biscuits, and mini vegetable tarts. These little biscuits were delicate, crisp and buttery, but not too rich. The tang of cheese, and fruit from tomato in the cream that held the biscuits together, made this simple thing bright and meltingly delicious. As was the mini tart, pastry and vegetables enhanced by a little blob of fresh cheese and a another of what I think was an onion reduction, gently spiced. A little dance of crunch, flake, melt, bright and mellow. Poached egg with parsley sauce, smoked eel and horseradish cream. Smooth and creamy, with the slight smoke and salt from the eel, this little creation was at once very delicate, and yet multi-layered. An intriguing thing to eat, my spoon came out each time with stripes of warm egg-yellow, or fresh green, streaking the purity of the fishy cream. 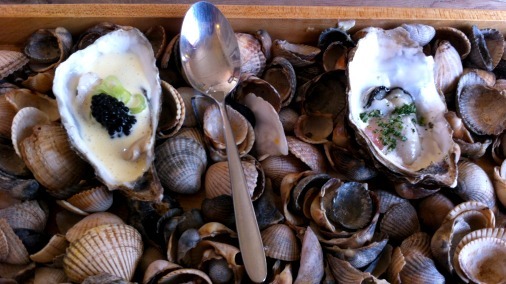 Poached rock oysters with beurre blanc, pickled cucumber & caviar (lhs), and seaweed and rhubarb granita (rhs). I squealed with pleasure when the oysters arrived, recognising my old friend from the Kent chefs dinner. It is hard to describe how divine this is without slipping into flowery prose. I think that at that dinner I just gasped, and savoured. It makes you think, it turns you inward, like the very best mouthfuls can. It is a slip of something at it’s most subtle, and yet most intense, fruit and fish taking a cool swim together, their best selves, and then followed by the umami edge of the seaweed, that you are left with as it lingers. The second oyster with beurre blanc was equally well balanced, salty, deeper, richer, a little more French in its approach, with the lemony buttery tang. The cool cucumber and pop of the caviar creating another mini triumph. Soda, sourdough, and rosemary & onion focaccia. At this point bread arrived, each variety delicious in its own right, and also helping me ensure that no drop of carefully constructed sauce or juice went back to the kitchen wasted. Although I am not averse to using fingers if need be, and sometimes need demands that I do. 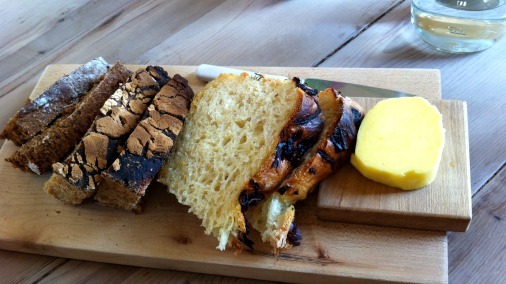 The butter at The Sportsman is very good, made in house from sour cream from a nearby Wealden dairy, and seasoned by extracting the salt from the sea that is but steps from the door. It is this kind of personal curiosity that characterises Stephen’s food and sets it apart. 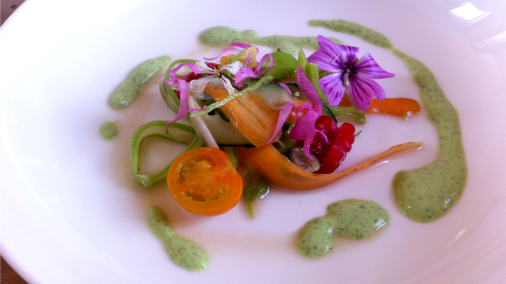 Vegetables from the garden, grand cru vinegar, herb and yoghurt dressing. While we were eating the first few things I had been watching Stephen pottering about the garden outside, selecting and picking. The stunning result then appeared before me. He explained how it was just getting to that point where the vegetables were at a peak, allowing him to serve them simply raw. The finest ribbons of the freshest possible vegetables created a green hymn, for the eye and in the mouth, with a hint of fruit from a raspberry, a darker pop from a sliver of new cherry. The yoghurt dressing was bright and fresh, minty, and the whole was brought together and given depth by an unseen hero, Stephen homemade vinegar. Using a wine vinegar mother and oak aged red burgundy, this is a vinegar with particular depth and interest, warm, aromatic and spicy, it’s background note on this dish was a spectacular addition. 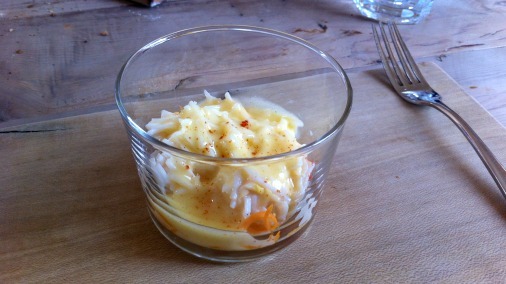 The strands of carrot and crab here intermingled and complimented each other, both sweet but fresh and balanced. They were brought together by the gentle binding of a light hollandaise and the warmth of a dusting of paprika, that grew as I ate the dish. 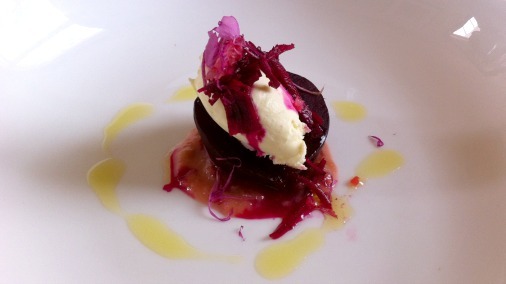 Salt baked beetroot, stewed rhubarb and fresh cheese. My photo does not do this beetroot dish justice. It was of such great, bright, pinkly glorious beauty. The colours sang! As did each flavour, distinct from one another and together. Earthy beetroot, sweet-sharp fruit, smooth milky cheese, the intensity of flavour was thrilling, and everything was perfectly seasoned, salty, sweetly balanced. I felt strongly enough here to make a note for myself as I ate, that what is delightful and striking is how everything tastes like the best possible version of itself. In this dish, and across the meal, that was my overriding joy about it all. 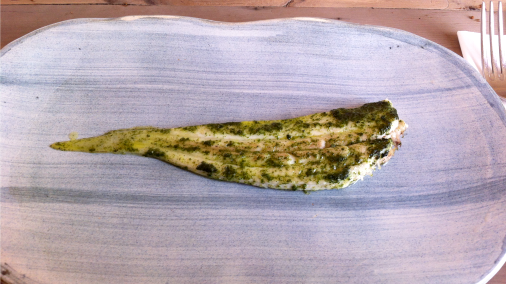 Slip sole grilled in seaweed butter. When this was put before me I, rather embarrassingly, burst into song. “You shall have a fishy on a little dishy.” My excuse is that it begged for it, in it’s simplicity, as it swam into view across the waves of its plate. In its appearance and its taste this dish was played down, and all the more successful for it. A gentle song of the sea, infinitely more eloquent than my crude outpouring. The flesh of the fish was lightly nutty, redolent of a macadamia, not anything more intense, seasoned and rounded by the earthy notes of seaweed, that in itself was mellowed by the anointing butter. Simply brilliant. 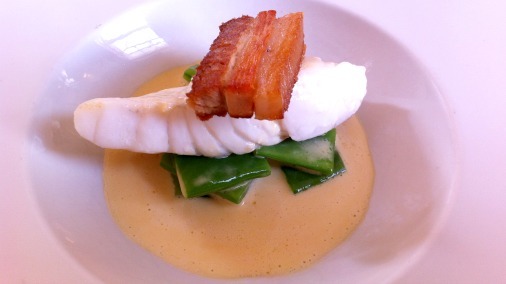 Turbot braised in vin jaune with smoked pork. Above are two versions of the next course, the second my own, as I don’t eat meat. 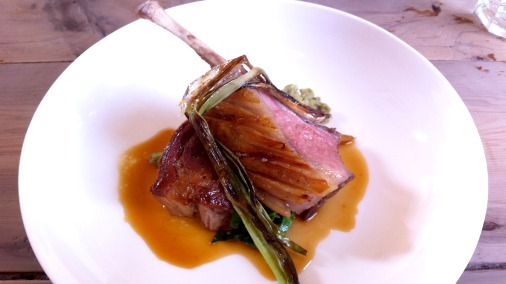 The aroma from this dish as it was put down was heavenly with the bright, rich, classic acidity of an intense sauce. 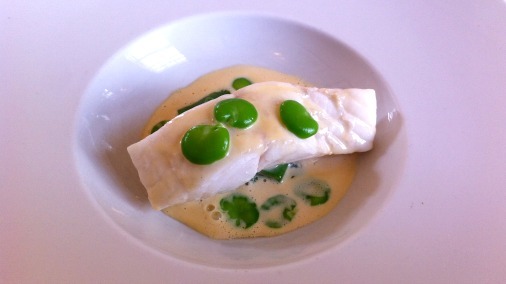 And the sauce did perfect justice to a perfectly cooked piece of exceptional turbot. It was a star player, managing to be fine and light, despite its intensity. There was also a very happy affinity of tastes between the tenderly flaking fish and the green beans on which it sat, subtle and yet full of flavour. Roast lamb from Monkshill farm. 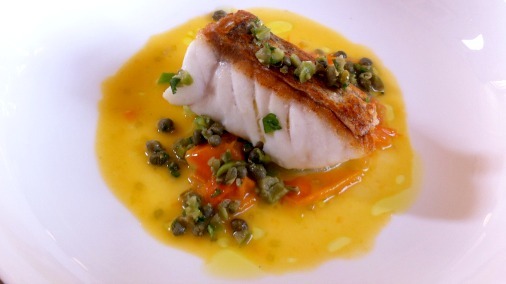 Roast hake with tomato and a green olive tapenade. Roast lamb was the final course before the desserts, and there were no complaints at all from my companion. I was brought this dish of roast hake. Having eaten such exceptional fish already, and more than a little bit full by now, it was quite extraordinary how this dish managed to ignite my senses anew, and had me grinning and declaring it the best dish yet. The zingy sweet freshness of tomato, with the green brightness of the tapenade, and a perfect piece of roasted fish nestling nuttily in the middle. The fish had that utterly crisp skin that gives you the luxury of roasted flavours combined with sweet mellow white flesh underneath. The sauce was so good that I cleaned the plate, not to waste a single drop of this essence of summer. 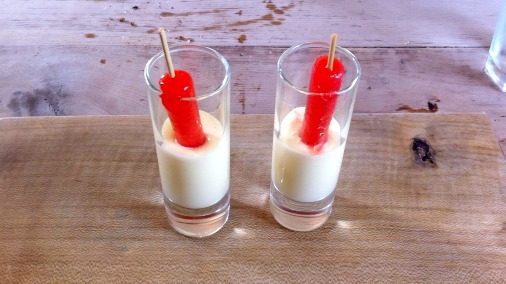 Strawberry ice lollies with a Madeira cake milk. 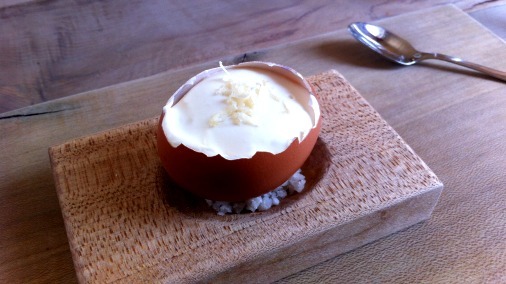 This cheery little starter pudding was both palate cleansing and comforting. The clean cut flavour of a perfect fresh strawberry was delivered in fresh icy shards. The cake milk was light, milky and with the nostalgic flavour of a classic cake. Very clever, very easy to like. 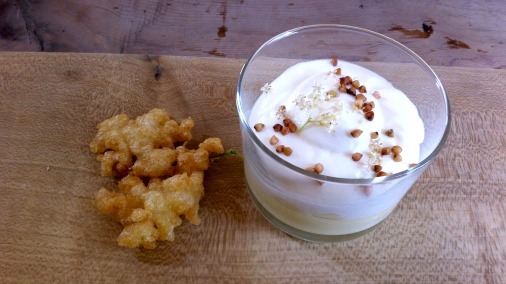 Lemon and elderflower posset, buttermilk mousse, toasted buckwheat, elderflower fritter. As our main pudding arrived the lady at the table next to us felt compelled to let us know it was the best pudding she had ever eaten, she was brimming with the love of it. So too shortly was I. This was an bewitching dance of creamy and crisp, of sweetness and fruit, of floral and toasted. The buttermilk mousse was light as air with just a hint of acidity. The posset green and floral, a delicate infusion of an early summer garden, like the pure fresh smell that enchants your nose in a cool sweet-scented flower. The toasted buckwheat was a delicately nutty textural foil for the creamy elements, as were a few little shards of meringue that added unexpected crunch from their hiding place in the posset. The puff of crisply fried sugared elderflower is quite delicious. A killer pud, killing me softly. 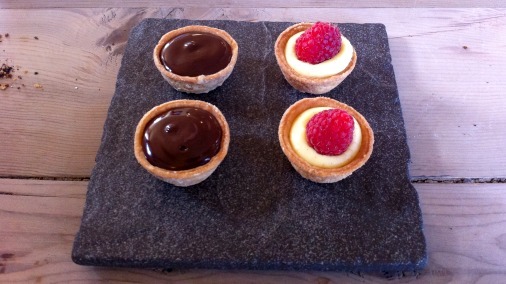 Chocolate and salted caramel tarts, raspberry and custard tarts. The final thing to eat, these two mini tarts, were a happy contrasting accompaniment to a fresh mint infusion and a coffee. Each created in the finest pate sucrée case, they were small but perfectly formed. Smooth vanilla scented custard and one perfect raspberry, a heavenly mouthful. The chocolate tart hid a layer of amazingly good, deep, dark, salted caramel. It oozed happily out from underneath its covering layer of dark chocolate ganache when I bit it in two. Even after all that had gone before it and being utterly replete, I wanted to make the finale last as long as possible.